This has been quite an interesting year. I thought I would write up a point-form summary of some things that went on. 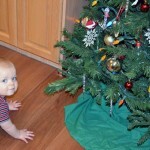 Was on maternity leave all year. This was interesting and I grew to enjoy it. Adjusted to being a parent, mostly it’s awesome. Recorded a track for the Virtual Choir. Sang with the church choir through the year. Went to my first TEDx conference. One of my co-workers passed away, which was sad. Did our first big improvement to our house- we finished the basement. We visited my family in Texas and they got to meet Wesley. I got a BlackBerry Playbook, which I really like. I took my first water fitness classes, which I (and Wesley!) really enjoyed. Enjoyed time with my friends even though sometimes having a kid means having to turn down invitations. Had good holidays and birthdays. Dealt with a few illnesses off and on- including the worst cold I have had in years, which we have at the moment. Wesley is pulling himself up and cruising on furniture now, and is a crazy fast crawler. He says mama and dada (though dada a lot more than mama) and cat, and occasionally mimicks other words. He’s been a bit of a bear the past week, but he’s also been sick. Most of the time, he’s charming and friendly and really easygoing. He flirts with people wherever we go, which is fun, but can be distracting. I pretty much won the baby lottery, because aside from feeding issues in the beginning, he has been a dream. He’s a great sleeper, he eats really well now, he’s pretty independent and plays on his own without needing a lot of intervention from me. He laughs and he’s ticklish and he’s fast and awesome. I love him like crazy. 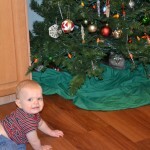 Tuesday, during naptime, I put up the Christmas decorations. The tree is in the basement this year, which actually makes the basement more cozy, I think. Yesterday was Wesley’s first day at daycare. We’re taking him part-time in order to get him comfortable before he goes full time in January, when I’m back at work. A friend of mine does childcare at home, and she’s awesome, so I’m more than comfortable with him there, but still, it is hard leeeeaaaaaving my baaaaaby. I got to stick around for a few minutes while he got accustomed to the surroundings (and the attentions of three charming little girls) but tried not to hang around for tooo long. Christmas shopping is done though, so hooray for that! I even wrapped the last few things. I am on fire this year. I’m back to work in less than a month now. We’re going to be moving into a new area of the building, so I’m excited to see that space soon. December started with a pretty big bang this past weekend! 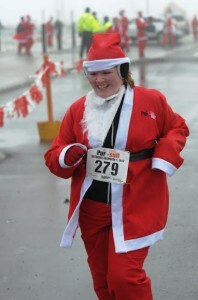 First, there was the Santa Pur-suit- a 5k race that’s done all in Santa suits. I signed up for it a while ago and it was a total blast. The weather was cooooold, but there was a little bit of snow, all stuck to the trees which made everything beautiful. The motorists who were waiting for the horde of Santas to pass didn’t even seem put out- they were just bemused at what was probably one of the more surreal events of their day. Everyone was a bit disheveled by the end but it was so much fun. Later in the evening, Trevor took me to see The Nutcracker in Mississauga! It was a touring company that was performing it, and it was fun. The Living Arts Centre is a really nice venue, convenient to lots of restaurants and shopping, so we were able to wander around and amuse ourselves pretty easily waiting for the house to open. Then, on Sunday, the Advent Carol service at church, which was really nice. It was super warm though, I was sweating buckets, but I really liked the music we did this year. Super pretty stuff.